HYPOCHONDRIACS BEWARE - would you believe the nastiest creatures in the known universe live inside our bodies? Finding a home and producing offspring in our internal spaces, parasites drink our blood, eat our cells, and infest our muscles. Not much can be said in their favor, except that they are truly fascinating. 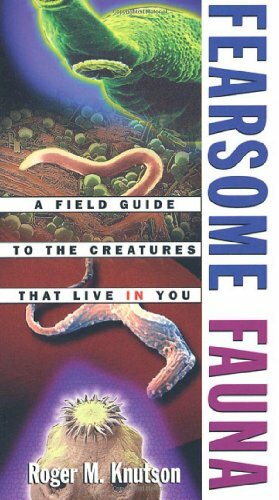 Fearsome Fauna is a wickedly amusing and startlingly informative look into the secret world of these parasites. From their lowly beginnings ("Life for a young hookworm begins in a pile of dung and for most of them it goes downhill from there") to their physical appearance ("In a contest for first prize ugly, tapeworms at any stage of their development would win hands down, if they had hands") and sexual practices ("many internal parasites are hermaphroditic; probably a good choice considering the difficulty of finding a mate in the bewildering darkness of our interior") author Roger Knutson tells you everything you always wanted to know about parasites but were too digusted or terrified to ask. Perhaps the greatest biological success story of all time (there are more kinds of parasites than insects), parasites have found homes in the vast majority of people on earth and have learned to live in their environment without destroying it. For readers who would like to meet these hard-working creatures>or learn how to avoid them>Fearsome Fauna is the perfect introduction.